Euro Tour. Week #6. Germany. 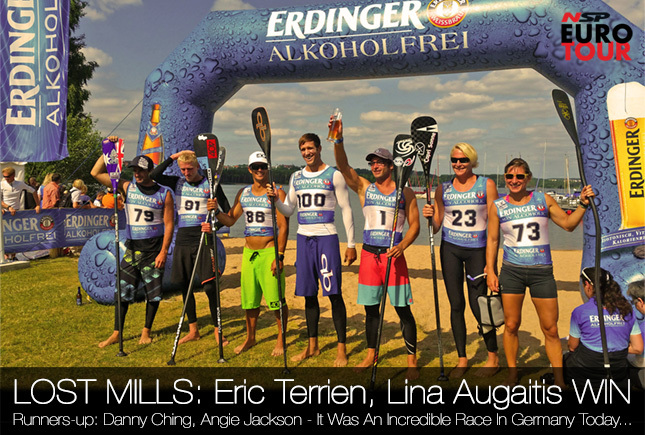 Eric Terrien has just won the 2014 Lost Mills, repeating his heroics from twelve months ago to claim victory ahead of a star-studded field. 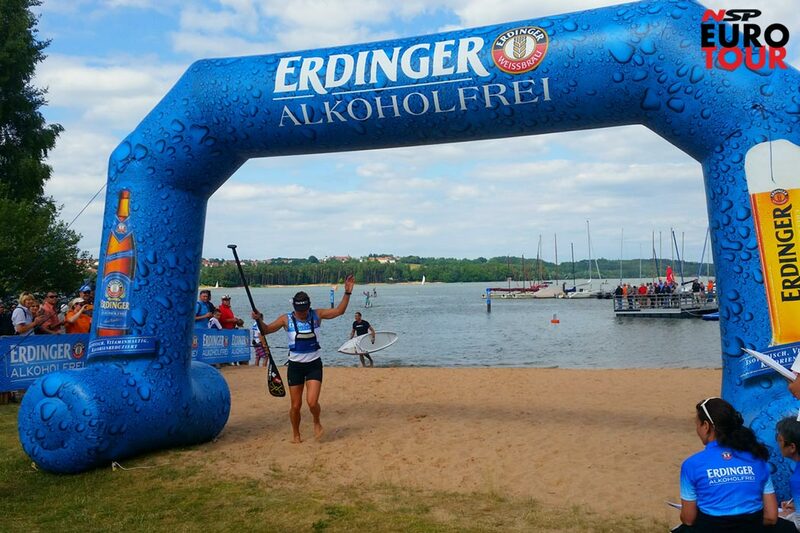 In a race that more than lived up to the hype, Eric won by two minutes from Danny Ching and Connor Baxter, while behind them were another dozen of the world’s very best paddlers. 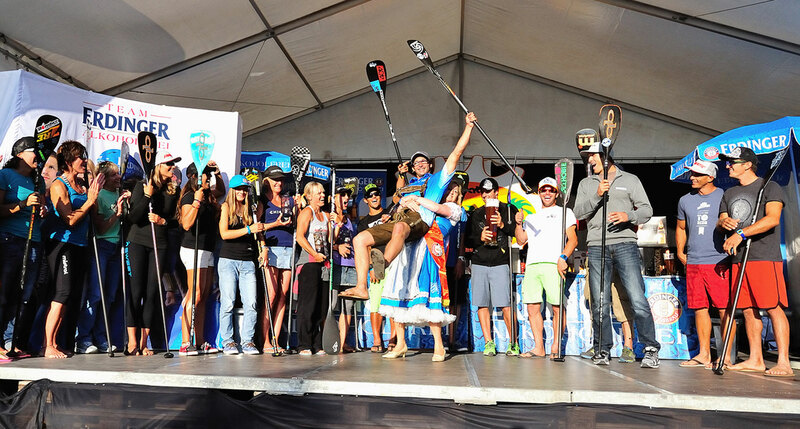 This was an incredibly competitive race – perhaps the single most-elite SUP race ever held outside the States – and it didn’t disappoint. Danny Ching set the pace for much of the race, however a slight mistake by the lead pack halfway through – where several of the top contenders veered off course – allowed Eric and a few others to make a break. The Frenchman took the most advantage of the opportunity and didn’t look back, powering away to eventually win by a big margin. At one point Eric had opened up a 4 minute lead, before a very fast-finishing Danny and Connor closed some of the gap in the final few kilometres. It was an extraordinary performance in what was an incredible race. Although the way he did it today was very different than last year, Eric’s winning margin is almost identical to twelve months ago and gives him back-to-back Lost Mills titles. 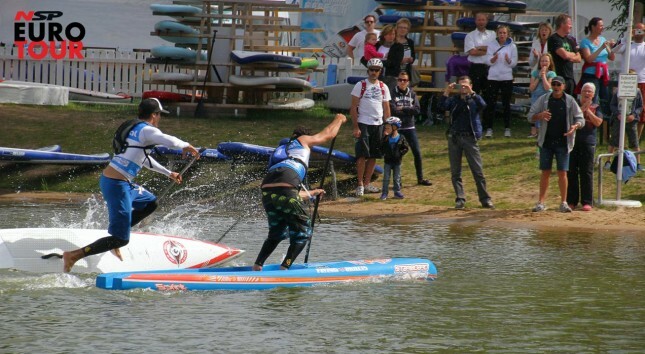 The top guys will certainly rue their mistake but take nothing away from Eric, who has shown once again that he deserves a spot on the top tier of the SUP racing world. 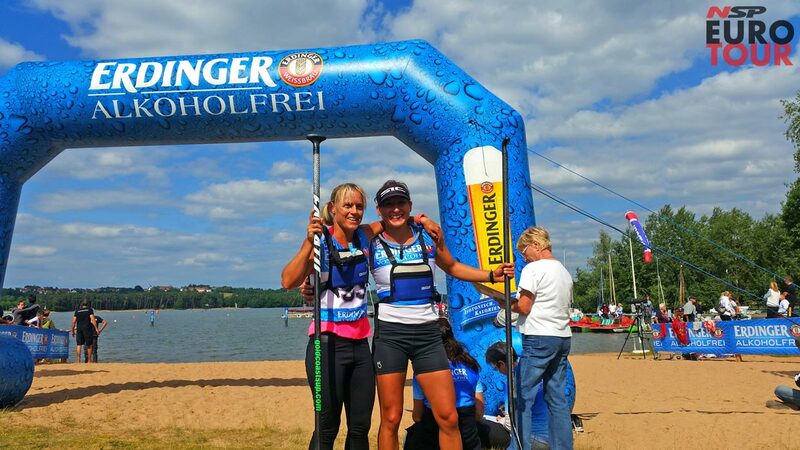 Meanwhile in the women’s race, Lina Augaitis showed she’s as good as anyone in the flat, paddling away from the in-form Angie Jackson and Sonni Hönscheid to take the victory. Although much of our focus was on the men, the top few ladies put on a great show. In the end it was the Canadian Lina who took the spoils, adding another trophy to go alongside the distance race gold she won in Nicaragua last month. We’re still trying to decipher exactly what happened with the guys going off course and who exactly was involved. We believe either Connor or Jake (not Danny as we originally reported) were leading the race but turned the wrong buoy. Doesn’t sounds like there was anything wrong with the course or the race briefing, sounds like the top few guys just headed the wrong way and most of the others sitting behind simply played a bad game of follow the leader. As many as 20 guys were involved, taking a 400 metre detour before realising their mistake and scrambling to fix it. 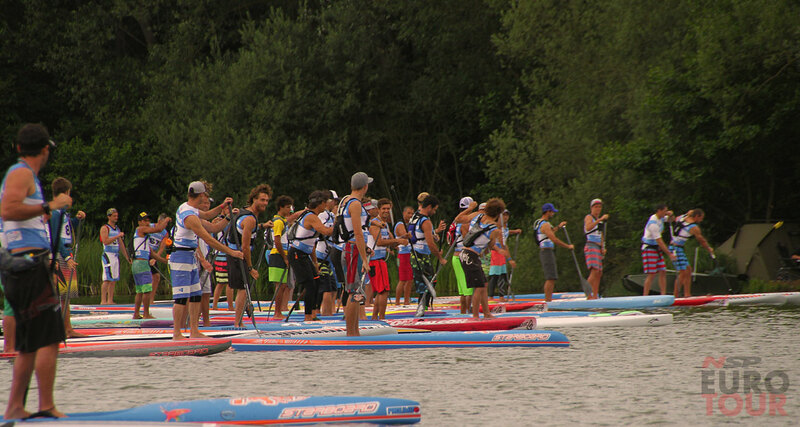 It’s as if the pied piper of SUP was out there. Jake said that the mistake sent him from 1st to 40th, so not only did all the top contenders lose sight of Eric, they also had to fight their way back past all the guys in the middle packs. I’m sure there are plenty more stories to come out of today and we’ll be doing regular updates as the news filters in over the next few hours. So refresh this page every hour for the latest from Germany. The 2014 Lost Mills was also stop #3 of the new Champions Tour. The excitement of this race will no doubt give a big boost in momentum to the CT and we’ll have a full recap of what this means for the overall season standings tomorrow. Note 1: As we mentioned above, at least 15 guys followed the leader off course and that’s why there are so many big names scattered right down the order. 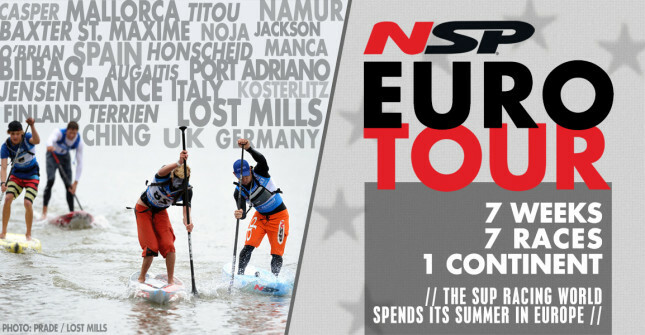 The Lost Mills is Europe’s premiere SUP race and this year’s edition may very well go down as the single most-competitive race ever held outside the States. Yes, the lineup is that stacked this weekend. Danny, Georges, Connor, Eric, Chase, Zane, Casper, Jake, Beau, Jacko, Leo, Vini, Titou, Angie, Sonni, Lina… you get the point. Lots of good paddlers are in the Bavarian countryside this weekend. It’s also stop #3 of the inaugural Champions Tour, just to give it an added layer of significance. Today, Friday, saw the first of the two main races at the Lost Mills – the 200 metre individual time trial (aka the “Fastest Paddler On Earth” race). Tomorrow is the main event, the 18km distance race, which holds all the prize money and prestige, however today’s time trial was a good opportunity to score some unique bragging rights. The super lineup of paddlers took turns racing down the 200 metre, straight line course, which is complete with Olympic-standard timing equipment and all. This is a pretty cool little race and a good chance to compare paddlers purely by the clock. And it looks like those bragging rights have gone to Danny Ching this year. After crushing it in the qualifying rounds, where he was at least three seconds ahead of everyone else, Danny carried that form into the final. The only guy to go under 50 seconds, Danny finished 2.66 seconds ahead of defending champ Connor Baxter, who had to settle for the runner-up position this time round. The 404 front man showed he’s in ominous form ahead of tomorrow’s main event and now has the title of “Fastest Paddler On Earth” for the next 12 months. Meanwhile in the women’s race, the field didn’t run quite as deep but the ladies near the top are all world class competitors. Lina Augaitis, Angie Jackson, Manca Notar and Sonni Hönscheid have been in superb form this year and dominated the women’s time trial. It was super close but in the end Lina took the glory for Canada, touching the line just a tenth of a second under a minute, which was less than a second ahead of Angie. 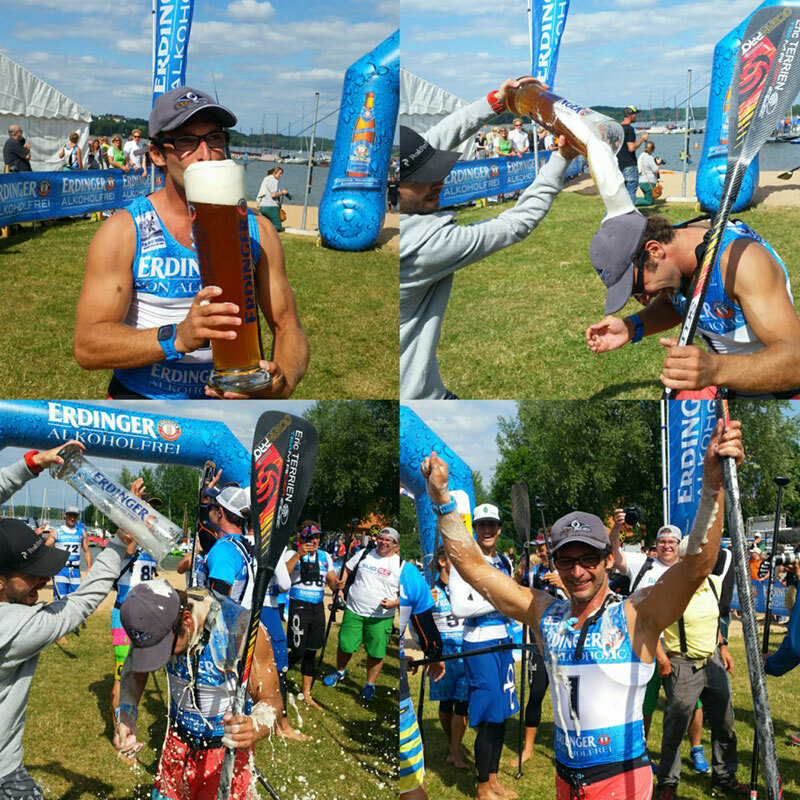 The race literally just finished moments ago, but thanks to our man on the ground in Germany, Peter Steinfath (Casper’s little bro), we’re getting minute-by-minute updates and results. The Lost Mills marks week #6 in our Euro Tour campaign. This is the big one. The main event. 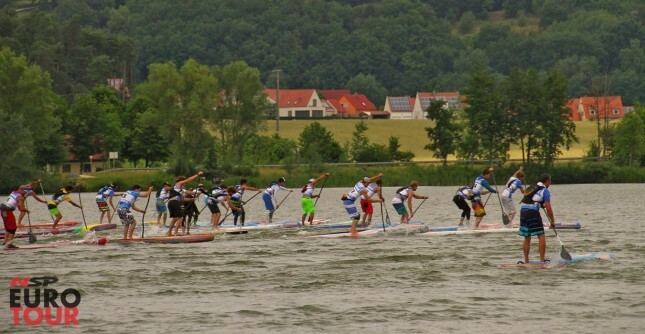 Europe’s premiere SUP race. It’s going to be a huge weekend in Bavaria, so stay tuned to SUPracer.com all day Friday and Saturday for live updates.